When I made the Chicken Kale Salad for Healthy Lunch Day, I decided I’d rather have an Asian Vinaigrette with a little bit of heat rather than a raspberry dressing enhanced with fresh ginger. So I came up with one. This dressing features low-sodium tamari (gluten-free soy sauce) plus fresh ginger and garlic. It’s perfect whenever you’re serving a salad alongside something like Asian Chicken Noodle and Spinach Soup or Soba Noodles with Roasted Eggplant. If you don’t like heat, leave out the sriracha. The dressing is gluten-free if made with gluten-free tamari/soy sauce and vegan. 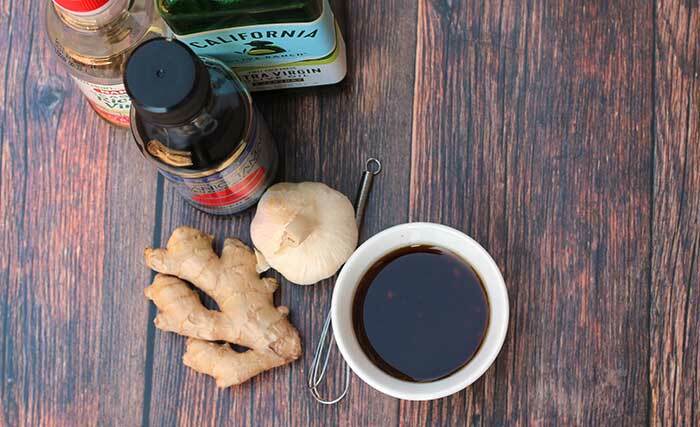 In a small bowl, whisk together vinegar, tamari or soy sauce, ginger, and garlic. Whisking constantly, add the olive oil in a steady stream. Season with sriracha (if desired) and pepper. If you don't want to whisk, place all ingredients in a small jar with a tight-fitting lid and shake vigorously. Gluten-free? Make sure your tamari/soy sauce is gluten-free.